Joan Wolbier was born in Buffalo, NY, but spent most of her childhood in Germany. She returned to the United States to attend the College of William and Mary in Williamsburg, VA. She chose a career in the arts working in both the fine and commercial worlds. As a graphic designer, she worked on staff as art director at the Smithsonian Institution and freelancer for the National Graphic Society. During her career, she studied figure drawing, painting, sculpture, printmaking, and book arts. In the early 1990’s she began painting with watercolors and fell in love with the medium. In 2005, her family moved to Boulder, Colorado. 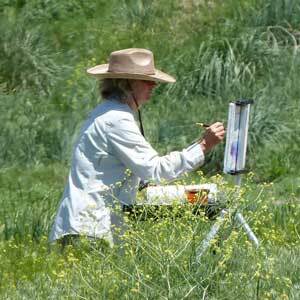 Although she loves to paint en plein air, she continues to express herself in a variety of media including drawing, book arts, and printmaking. She has a BA degree in Fine Arts and a Masters in K–12 Art Education. She teaches classes and workshops in watercolor painting, drawing, and bookmaking.